Sigh. Why must people continue to devalue our crafts by selling their hard work as quick or fast? Is everything anyone is looking for fast or quick? Why do we continue to sell this work as such? 1. They are in the bulkiest weight yarn possible. 2. They are simplest of the simple stitches. Garter stitch or stockinette in knitting. Single crochet or double crochet in crochet. But the secret no one talks about is the fact that there are an incredible amount of stitches that are simple to learn and can be done by any person with experience in a short timeframe. Yes, there really are experienced people that can do a blanket in a weekend, but they don't go around saying "Look! I did this quick crochet project!". They say "Look at this great pattern! It was super fun to learn and I got into the rhythm of the stitches, and the yarn patterned out beautifully." And how many of us have heard knitting or crocheting lamented because someone gave them a bulky, scratchy sweater that they hated? What comes with experience is the understand of what amounts to the project management triangle. 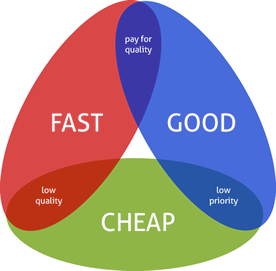 As the saying goes in our world, there are fast, good, or cheap, but you can only pick two. Fast project with cheap materials = low quality crap that ends up in a thrift store. Fast project with good quality = low quality crap that ends up in a thrift store. Cheap materials with good quality = Can sometimes be an excellent project if chosen with the right intent in mind and an understanding of the giftee (i.e. using a HL I Love This Yarn or Caron Simply Soft for a project for a baby outfit for a new mom, or using RH Soft for a pet project). Which brings me back to the beginning video of Speedy Gonzales. For those of you whippersnappers who don't know who he is, Speedy Gonzales was a super fast mouse who was one of the characters on the Warner Brothers cartoons, starting around 1953, and broadcast well into the 1980s. Speedy was a nice friend to have around - he could save his fellow mice buddies from the evil cats. But at the same time, Speedy wouldn't speak in coherent Spanish, and he would try to take all the women from his buddies. By focusing on speed at the expense of all else, Speedy lost out on the things that make life interesting. His women weren't wooed, they were taken. Instead of enjoying the scenery, he speeds by. The same thing happens when crafting. You can speedily do something, but then the connection and the interest in the project speed on by. We need to think about how we market our work as crafters and designers to focus on quality, not quantity. Fun, interesting patterns that can be done without the use of the words fast or quick or super bulky that can still be completed in a weekend. Even Speedy reformed his ways - his last appearance was helping his nephew Lightning Rodriguez win an Olympic race on Tiny Toons. Think about it folks. Instead of saying how quick something was, talk about how much fun it was that you couldn't put the pattern down all weekend. Instead of saying how fast something was, talk about how interesting the pattern developed over the course of your stitching. We can make the world a better place by reforming how we talk about our crafting works!